mbaMission Interview Workshops in NYC, Chicago, San Francisco, Los Angeles, D.C. This Thursday, October 30th, our friends at mbaMission will be running Interview Workshops in our New York, Chicago, San Francisco, and Los Angeles centers. These workshops will prepare you for the sorts of questions your MBA Interviewers are likely to throw your way. We’re very glad to be able to offer these events to the Manhattan GMAT community. These workshops are FREE. However, space is limited in each location; click on the appropriate link above to register. mbaMission will also be running an Interview Workshop next Thursday, November 5th, in Washington D.C. Thanks to mbaMission for putting these events on! Last week, I attended the GMAC Test Prep Summit, a biennial gathering held by GMAC specifically for test prep companies. Most of the things we discussed are probably only of interest to those of us who work in the industry. There were a few things, though, that would be quite useful for students to know. Rudner, Lawrence M. (2009). GMAT Psychometrics. Materials presented at the 2009 GMAC Test Preparation Summit, New York City, NY. October 15, 2009. BusinessWeek just posted an article that talks about a trend among employers using GMAT Scores as a proxy for ability, sometimes to determine which candidates to interview. The article even includes accounts of Business School administrators and professors advising MBA students to re-take the GMAT (after they’ve already begun attending Business School!) in order to burnish their credentials. Who knew? Apparently, your GMAT score sticks with you and may matter even after you get your admissions letter. It’s a good reason to do as well as possible. The above also suggests that students and others in the job market may be well-served to take the GMAT to be able to stand out to potential employers. E.g. if you’re a senior in college and get a 750, that score on your resume might catch a company’s eye. 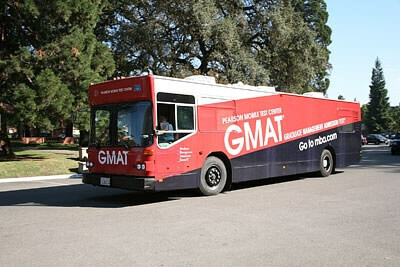 All Aboard the GMAT Bus! The organization that administers the GMAT, the GMAC, is always looking to make the test available to anyone who might be interested in graduate business education. That’s why, once again, the GMAT bus is making the rounds, bringing the exam directly to students. Originally launched in 2006, the bus will visit 32 schools in 14 states. Its 8-month cross-country tour begins in Stockton, California, at Humphreys College, on October 21 and will end with a visit to Bethune-Cookman University, in Daytona Beach, Florida, on May 7. So if you’re far from a regular testing center, you should check out the tour schedule and see if it might be a fit. The program aims to recruit more diverse business school applicants by bringing the exam to students who might have trouble getting to a testing location. Kudos to GMAC for getting themselves out there. Also, we’re just entertained that there’s actually a giant GMAT Bus! Imagine seeing that on the highway . . .
GMAC, the publishers and administrators of the GMAT, are hosting their bi-annual summit here in New York on Thursday. The purpose of the summit is to let those in the GMAT ecosystem know about research, trends, and upcoming changes to the test (if any). We’re very privileged to be invited again this year! It’s always a fascinating day when you get to hear from and speak to the minds behind the GMAT. We’ll post an update here after the summit regarding items of interest. Update – Well, the GMAC Summit 2009 is now in the books. In all frankness, there wasn’t much revealed to interest the average GMAT test-taker, aside from an affirmation of points made earlier (e.g. the early items are not worth expending extra time on). Our friends at mbaMission receive many questions about Business School Interviews. What types of questions will they ask? Is it better to interview with the Admissions Committee or an alumnus/alumna? How much do these interviews matter? In an interactive presentation, Jeremy Shinewald, founder of our Admissions Consultant partner firm, mbaMission, will offer advice on best practices to help you prepare and succeed in your business school interviews. He will explore the different types of interviews, what each admissions committee is looking for, and tips for time management. There will also be a Q&A session after the presentation. Like a rockstar, Jeremy has scheduled two workshops to try and accommodate everyone’s busy schedules. The first one will occur on Wednesday, October 21st, from 8:30 – 10:30 P.M. EST. The second will take place on Sunday, October 25th, from 3 – 5 p.m. EST. Both events are free and take place in our interactive online classroom. Space is limited, so click on the appropriate link to sign-up today. Emily Sledge, one of our veteran Instructors who also serves as an Instructor Developer, is moving from sunny California to St. Louis! Emily first joined MGMAT back in 2005 and has helped literally hundreds of students achieve their GMAT score goals. Before then she earned an engineering physics degree from Cornell, an MBA from UCLA, and a 790 on the GMAT. Whew! We know the students in Orange County will miss Emily terribly. On the other hand, this is fantastic news for Missouri! If you’re in the St. Louis area and would like to get on our mailing list for upcoming courses later this year, click here. Best of luck with the move Emily! It’s a little bit of Digg, a little bit of ESPN, and it’s all GMAT-related. . . it’s the Manhattan GMAT Study Hall! As you probably know by now, the GMAT is a Computer Adaptive Test (“CAT”). This means that the questions that you see on the exam are selected by the computer based on your performance on earlier questions. For example, if you answer a question correctly, your next question will be harder. If you answer a question incorrectly, your next question will be easier. The exam is trying to gauge your ability level by seeing how well you do with questions (known as “items” in testing parlance) of varying degrees of difficulty. Generally speaking, the harder the questions you answer correctly, the better your score will be. There are other factors besides difficulty level that influence the selection of items on a particular exam (e.g., question type (data sufficiency vs. problem solving, for example), content (e.g., algebra, ratios, assumptions, etc. ), and exposure (i.e., how many times has the question been seen by other test takers already that month?)). But difficulty level is arguably the most important. The CAT does not “bucket” items into “easy”, “medium”, and “hard” categories. Instead, each item can be considered easy, medium, or hard depending on the person to whom it is given. Each item is tested out for a period as an unscored “experimental” during the actual exams of people taking the GMAT. After a sufficient sampling of test-takers has answered the items, ETS compares the overall scores of the test-takers with their performance on the experimental items. If, say, fifty percent of all test-takers scoring in the 600-620 range got a particular experimental item right, that item would be considered of medium difficulty for that ability level. If ninety percent of those scoring in the 700-720 range got the item right, it would be considered easy for that ability level. When the item is then presented as a real scored question on subsequent exams, the computer uses the experimental data to determine whether the item is appropriately difficult for someone performing at a given level thus far in the exam. The computer tries to give you questions that you have a 50/50 shot at, based on your performance up to that point. The better you do, the harder your 50/50 items will be.